The first part of the publication contains an analysis of the latest FDI trends complemented by detailed methodological explanations. 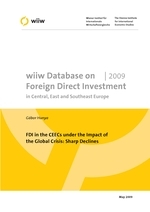 After years of continuous growth, FDI inflows to the CEECs stagnated in 2008. Their decline in the NMS and in the SEE countries was compensated by a virtual boom in the CIS due to round-tripping Russian capital. In 2009 FDI is going to contract significantly, but it will still be more resilient to the crisis than other forms of foreign investment. Large FDI inflows in the past earn high rates of income to foreign investors who repatriate a growing share of their income. In some countries, in 2008 the amount of repatriated income exceeded the amount of FDI inflow. This negative direct effect of FDI on the balance of payments was partly countered by the foreign trade surplus generated by foreign affiliates. First quarter data indicate that in 2009 FDI may finance a bigger part of the, rapidly contracting, current account deficit than previously. The second part of the publication contains two sets of tables: Tables I cover total flow and stock data according to the respective countries' central banks while Tables II provide more detailed FDI data by economic activity and by country. The main source of data are the central banks of the individual Central, East and Southeast European countries. FDI flows are taken from the balance of payments, stocks from the international investment position statistics.